Few glassworks have exploited the bluish-green combination of cobalt, copper and iron more successfully than that founded in 1840 by Johann Loetz in Klostermuhle, Bohemia, which was within the Austro-Hungarian empire during most of its period of operation. Even though Loetz died in 1848, the Loetz factory was initially operated by his wife under the name Glasfabrik Johann Loetz-Witwe (the Widow Johann Loetz Glassworks). It retained that name until its closing during the Second World War. By the early 1880s the Loetz works had acquired a reputation as a manufacturer of fine glass, produced under the direction of Loetz's grandson Max Ritter von Spaun. He modernized the works and introduced innovative glass types and production techniques, several of which he patented. By 1889, Loetz glassware was well enough established to exhibit at the Paris International Exposition, held under the newly constructed Eiffel tower. The Loetz pieces won critical acclaim for the "Onyx" range and other lines of highly polished, opaque glass with contrasting veining that simulated natural hard stones. The Paris Exposition of 1889 was the launching pad for many of the century's finest glassworks and it is widely accepted as the birthplace of Art Nouveau. Émile Gallé's earliest artistic glass was shown there as was Louis Comfort Tiffany's "Favrile" glass. Loetz' work displayed there was reminiscent of Galle and Tiffany with its display of ornate, free-blown vases with applied slivers of opalescent glass. Spaun was further encouraged by successes at the 1893 Columbia World's Fair in Chicago, and he concentrated his efforts on developing iridescent finishes. In 1898, after several years of experimentation with variations in firing, he patented a technique to produce the deep blue or gold metallic luster for which Loetz is known. It is still the most identifiable and most sought-after feature of Loetz glass. Spaun celebrated with an impressive exhibition of vessels he designed for production in the new technique in Vienna, Loetz's closest and most receptive marketplace. Within a few years of the exposition, the Loetz-Witwe works became regarded as one of the finest and most progressive producers of Art Nouveau glass in the world. Most Loetz glass was commissioned by outside designers, and the best pieces were produced by the union of Loetz and Austrian designers. 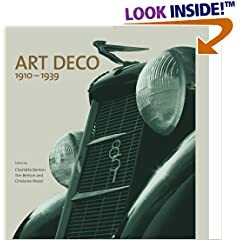 Many of these designers were aligned with the Vienna Secession Art movement which included Koloman Moser and Josef Hoffman. Loetz combines subtle but innovative forms with very advanced techniques in the use of color and artistic methods such as feathering. The principal staff designer for Loetz between 1903 and 1914 was Maria Kirschner, who was born in Prague but studied and practiced in Paris and Berlin. Kirschner favored subtle forms of elegant simplicity with little decoration beyond applied handles. 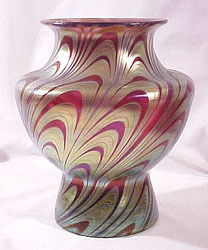 Kirschner's work contrasted with the French Art Nouveau forms, including gooseneck vases and pinched, organic shapes, sometimes applied with tendrils of iridescent glass produced from the late 1890s. Kirschner designed more than 200 works for Loetz, some of which are signed with her monogram--not to be confused with Moser's mark of capital letters MK engraved. Her forms and scale are similar to the work of Louis Comfort Tiffany, whose career in glass making parallels that of Loetz and whose style shows a clear Austrian influence, perhaps learned as early as 1889 when Tiffany admired Loetz's display at the Paris Exposition. 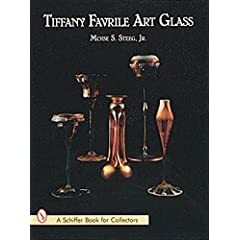 It is widely believed that glass workers from Loetz and other Bohemian factories defected to Tiffany's works in New York City, which would have been a welcome haven for emigrant artisans in the early years of the early twentieth century. In contrast to the fully evolved Art Nouveau spirit of Kirschner's Loetz, the designs by Josef Hoffman and his followers tend to be of controlled, almost architectural proportion. The combination of bold simplicity of form with vibrant, lustrous color and organic, pitted surface treatment created art glass of the highest quality. 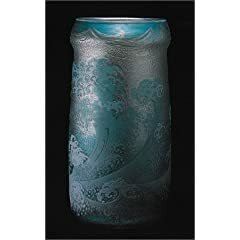 Loetz is fine art glass expressing the vitality and creativity of a most exciting time in the decorative arts. Buy period Loetz, Steuben, Galle, Tiffany, and other finer art glass on the Collectics Fine Antiques and Glass pages, or search the entire site for great antiques, collectibles, and crafts for every collector!